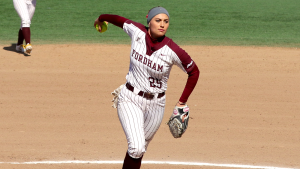 Lauren Quense was one of the main stars for the Rams this week, as they won four out of their five games played (Courtesy of Fordham Athletics). 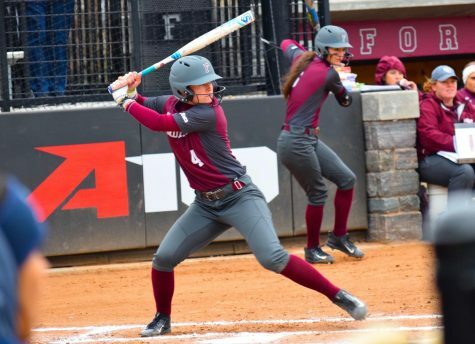 This past week, Fordham Softball swept George Mason and split contests against Lehigh and Binghamton, adding four wins and one loss to its record to improve to 19-17 on the season. 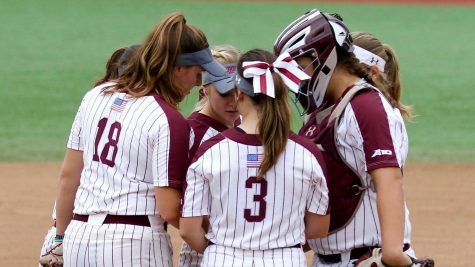 On Wednesday, April 4, the Rams fell to Lehigh 8-6 in eight innings in a barn-burner at Bahoshy Field. Despite trailing 6-2 heading into the bottom of the sixth, the Rams rallied for four runs in two innings to push the game to extras, thanks to an RBI single by junior Chelsea Skrepenak and home runs from sophomores Madie Aughinbaugh and Skylar Johnston. 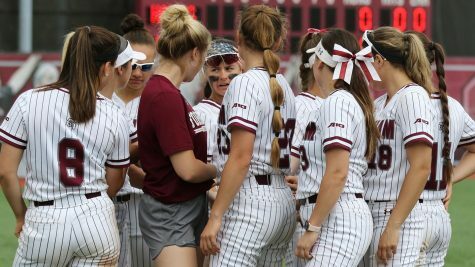 Freshman Anne Marie Prentiss suffered her first loss of the season after Lehigh posted two runs in the eighth inning to put the Rams out of reach. 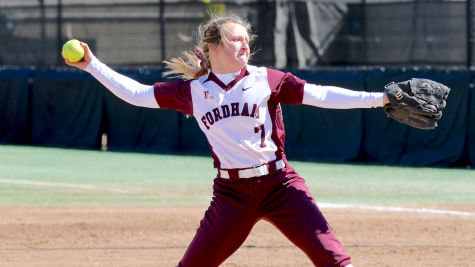 The following day, Fordham bounced back with a 4-0 shutout over Binghamton. Aughinbaugh earned the victory by pitching all seven frames, striking out six batters and scattering just three hits. 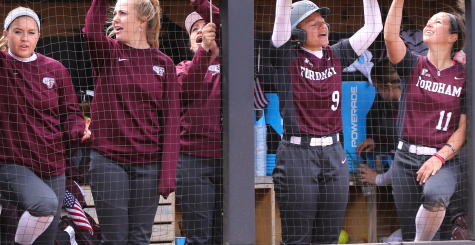 The Rams plated runs as a result of Skrepenak’s 3rd-inning two-run triple-turned-homer and 6th-inning one-run single, as well as freshman Paige Rauch’s 4th-inning RBI walk. 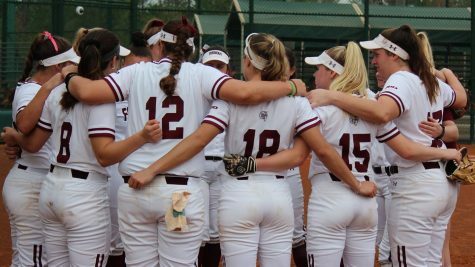 On Saturday, the Rams triumphed twice over George Mason, 4-2 and 10-0, with the latter ending in just five innings. 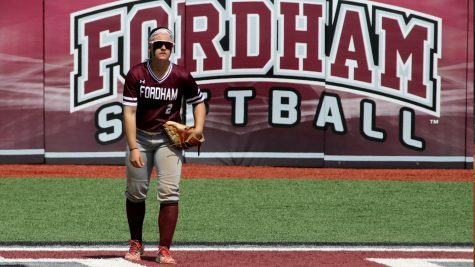 In the early game, Fordham got its offense from a Johnston solo homer, a Skrepenak two-run double and a Deanna Burbridge RBI single. Aughinbaugh twirled a complete game in the circle, allowing only two unearned runs and earning her tenth win of the season to move to 10-6. In the later blowout, the Rams’ hitting overpowered George Mason. Junior Kylie Michael got the scoring going with an RBI single in the second inning before crossing the plate herself on graduate Lauren Quense’s double to right field in the following at-bat. 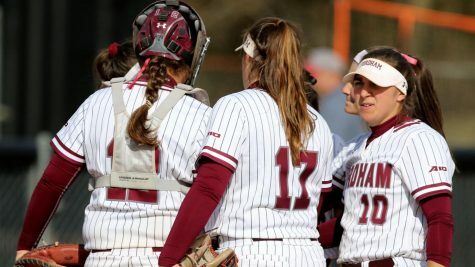 Rauch blasted a three-run homer in the fifth inning, and Quense ended the game in that same frame by launching a grand slam over the left field fence, giving her five RBIs on the afternoon. Rauch also pitched five scoreless innings, striking out six and allowing just four baserunners in victory. 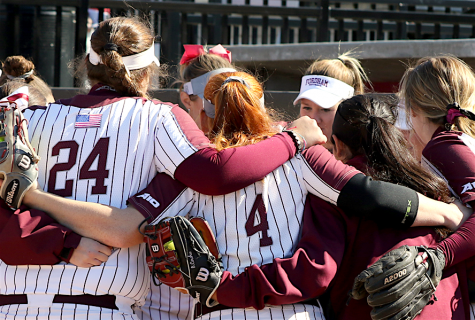 On Sunday, the Rams tallied ten runs once again, winning 10-2 in six innings. Johnston, Aughinbaugh and Rauch (twice) sent hits out of the park, while Quense and Burbridge also delivered RBIs en route to victory. On the mound, Rauch pitched four scoreless innings in relief of Aughinbaugh and took the W, moving to (8-1) on the year. 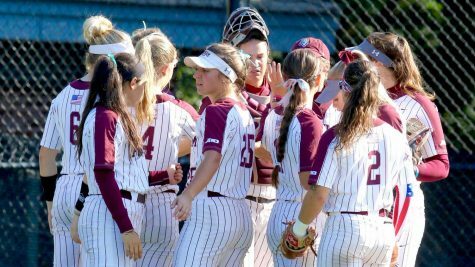 After five games at home, the Rams will travel to New Rochelle, NY to take on Iona before heading to Kingston, RI for three matchups with Rhode Island. As the regular season approaches its midpoint, the Rams will rely on their more seasoned players to guide the way.